To be perfectly honest, this is not what I am wearing today for Easter, but it would be perfect for the occasion. I wore this mix of stripes and dots last week for work and many people commented that it was the perfect ensemble for spring. No doubt that my pastel colored statement necklace was really what brought out the spring in the outfit, not to mention helped to tie everything together. This outfit was actually a result of blindly groping around my closet at six in the morning. Sometimes I think I do my best work that way! Well, even if this is not what I am wearing today, I'll be posting the real McCoy later on in the week. For now I have to focus on decorating some eggs, making the mashed potatoes, and preparing for our family's epic Easter egg hunt. (I win it every year!) Whatever you have planned, have a Happy Easter! This outfit is so darling. 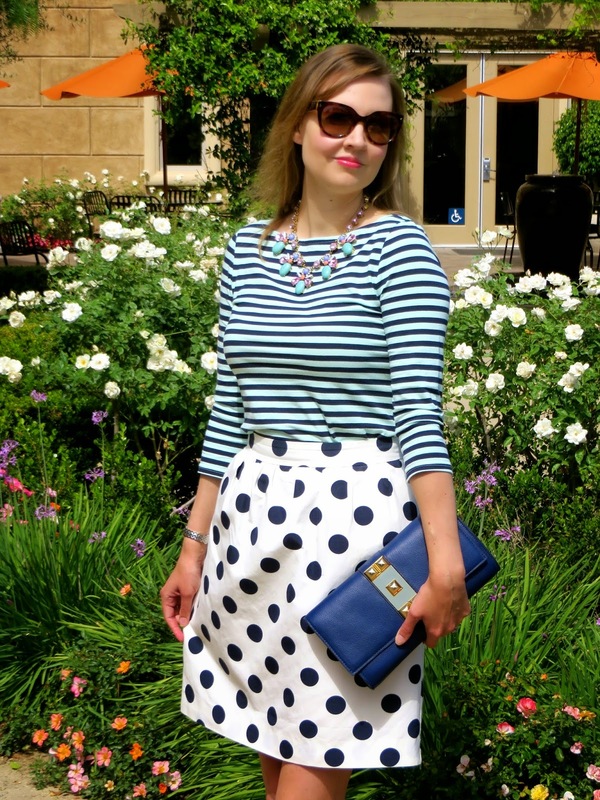 Stripes and dots are always meant to be. I need some Silver Pumps like yours. Thanks Ada! Yes, definitely get a pair of silver pumps. I wear mine with everything! Mix those patterns girl!! I LOVE this outfit. The print mixing is just perfection. Also we're kind of shoe twinsies in our posts. Metallic pumps just make you feel a bit more sassy - don't they? Thanks Nikki! Yes, I am totally addicted to metallic pumps or sandals. They do provide a little something extra to any outfit. Thanks for stopping by! Thank you Abby! I love to pattern mix, but I try to do so in subtle ways. Thanks for stopping by to say hello! How adorable is that skirt! That skirt is perfect on you! Loving your stripes too! Hope you had a wonderful Easter! Thanks! I hope you also had a wonderful Easter! In regards to pattern mixing, I am never quite sure if what I think works actually does work...but that's the fun of it! Blogging has made me more adventurous with mixing it up. But as you said, you can't go wrong with dots and stripes! Love this! You may have just inspired another outfit for me. I have a similar top and just bought a polka dot skirt with flowers but was about to send it back. It may be a keeper now, just have to see if it will really work with the flowers in the skirt. Thank you! Hopefully the skirt works out for you. It sounds adorable! Thanks! This outfit sort of just put itself together and wasn't really planned. I think dots and stripes look cute if they are the right proportions. You should definitely give it a try! You have a great knack for mixing patterns! 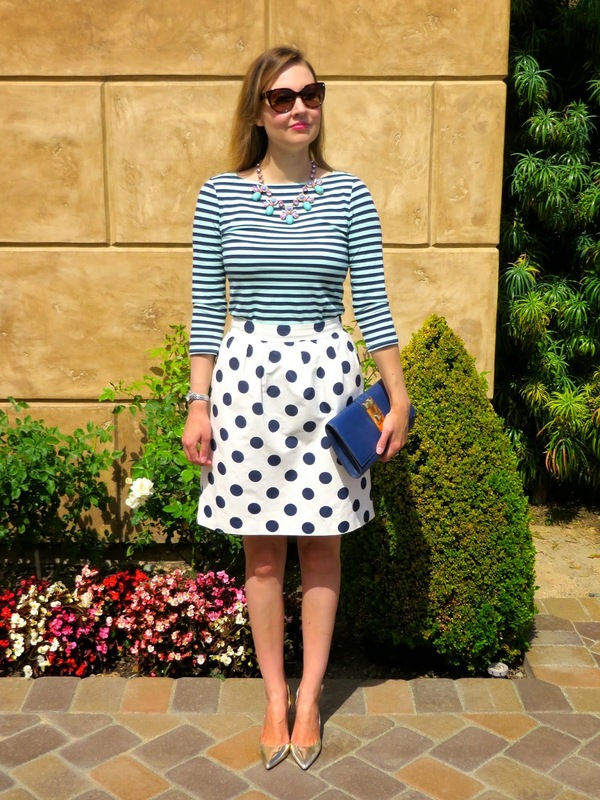 Love the stripes and polka dot skirt pretty!! Thanks Jessica! I am still trying to get the knack of mixing patterns. I appreciate you hosting your linkup this week!